Reason for blast chilling or shock freezing: This guide won’t delve into the reasons to own a blast chiller which is reasonably well addressed here, and more details here. Let’s suffice to say that products that have been rapidly chilled will likely hold 2-3 days longer and taste better when rethermalized. Also, if you wish to refrigerate freshly cooked food, it can get contaminated while cooling down in a cooler. So whether you’re saving labor by cooking items in bulk or preparing for a catering event, Blast chillers can be very effective. How much product will you need to process at once? Blast chillers have a wide range of capacities rated in poundage from 30 lb to 1,300 lb at a time, and they typically utilize 2-inch deep pans, each holding about 10 pounds (depending on density) of product. Analyze the products you plan to use in your blast chiller and determine their weight in pounds in order to size your blast chiller appropriately. What size containers will you need? By purchasing pans that are too big for the products you need to chill, you run the risk of compromising the cooling process. Container sizing is just as important as the size of the unit as a whole, so keep this in mind when analyzing your products to be chilled. Some units can hold up to 40 full-sized food pans or 10 sheet pans! What is the setup of your kitchen? While the footprint of the unit is the most obvious cause for consideration, you’ll also need to allow room for ventilation for many units. What type of model would benefit your restaurant the most? Fits conveniently beneath worktables, correlating well with the production layout. Best for smaller batch productions and for kitchens with countertop production units. Can include shelf space underneath, freeing up space for other equipment. Best for smaller batch productions and chilled desserts. These house permanent racks inside of the cabinet that can accommodate either hotel- or full-size sheet pans. Best for institutions, cafeterias, hotels, large batch productions. Utilize mobile tray racks and are better suited for larger quantities of food (200 lb +). Can allow the seamless transfer of pans from combi-oven to chiller if the racks are the same size. 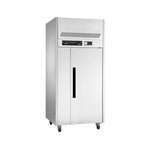 Best for institutions, cafeterias, large batch productions. Compressors: an undercounter refrigeration unit of equal size to an undercounter blast chiller will require a far less powerful compressor than its blast chiller counterpart. For instance, a 27-inch undercounter refrigerator may only need a ¼ or ⅕ horsepower compressor while a same-sized blast chiller may require a ½ horsepower compressor. Condensers: similar to a refrigerator or freezer, the placement of a blast chiller’s condenser is of importance, as these can come self-contained or remote (in larger units). With top-mounted units, the compressor, evaporator, and condenser are all located above the cavity. Expelled heat from the condenser rises above the unit rather than into the work area. Coils are harder to clean because they’re above the unit, but top shelves are lower, making them easier and safer to reach. Best for dry storage areas (where floors may be dusty), where people are working near the unit. Bottom-mounted units separate the compressor from the evaporator and condenser, placing the intake below the cavity and the evaporator above. Grease-laden steam rises above the compressor, reducing the possibility of gumming up the system. More insulation is needed because heat from the compressor may rise into the cavity, and refrigerant lines must be run through the cabinet from the compressor to the evaporator, taking up precious space. Since heat rises, the air in a warm kitchen is cooler below. Best for hotter working areas, near cooking lines. Especially helpful for larger units, an exterior compressor and condenser located outside of your warm cooking area in order to gain efficiency. Best for larger models, for those with noise considerations (exterior location makes for quieter operation), non-mobile applications. Flexibility: Cool smaller batches of different products at the same time. Efficiency: You don’t need to cool the entire interior for a small batch of product. Versatility: For larger batches, simply opt to use both compartments at once. During slow times, your unit is versatile enough for users to utilize only one compartment at a time. 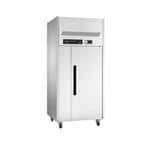 Blast chillers are designed to chill foods immediately after they’re prepared due to food safety and quality concerns. Thus, you’ll want to keep the following in mind. Opt for Oversizing: Your restaurant traffic and menu demands may increase, but that doesn’t mean that you can prepare large batches of food and split up the chill process because your blast chiller is too small to accommodate the larger demands. You need to opt for oversizing, making your blast chiller larger than your immediate demands so that it can accommodate an increase in batch sizes should the need arise. Understand Your Batches: Purchasing an oversized chiller is appropriate if your batches are large, but you may have issues if you’re blast chilling large amounts of items that are different batches and are being chilled at different temperatures and time. If this is the case, then be sure to choose the chiller with two independent cooling compartments, as you cannot keep adding items to the cavity over time and expect the chiller to compensate for the changes (i.e. chilling delicate pastries alongside tough meats). The type of product being chilled can influence the type of chilling process you select, as many blast chillers now offer both hard and soft chilling capabilities. These are primarily distinguished by the cooling temperature during the chilling process and can impact the quality of the product. Customizable cooling also reduces the risk of bacterial growth, which can quickly taint a product if not chilled correctly. 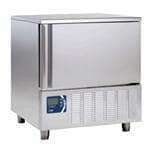 A less harsh process than hard chilling, soft chilling gradually brings food temperatures down to less than 40 degrees. Best for bakery items, rice, and vegetables. This chilling process is quicker and brings product temperatures down to an almost frozen state. Best for hearty products, dense foods, and meats. With shock freeze capability, product temperatures can be brought down to zero degrees or less for freezer storage. Best for products to be shipped, mail-order foods, frozen pizza. Built-In Electric Defrost: these eliminate condensation on the condenser coils (while other units will need to be drained), reducing maintenance and labor costs. Ultraviolet Light: this interior light sanitizes the interior of the cabinet. DC Connections: data ports can be used to upload reports to a computer or a USB drive for downloading temperature details on a portable storage device. Printers: information is printed on paper to offer data recording capabilities for Hazard Analysis & Critical Control Points (HACCP) documentation. Extra Probes: great for larger units in order to monitor different food types simultaneously. Blast chillers are one of the safest ways to cool foods from hot (around 160 degrees) down to cold (38 degrees or less) in about 90 minutes or less, depending on the type of chill and product. 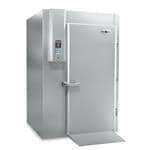 These units are intended for chilling food, not storing food like refrigerators and freezers. As such, they’re typically purchased in conjunction with both production units and refrigeration units. Most blast chillers will automatically go into a refrigeration mode once the temperature or time limit has been reached. Blast chillers work by forming microcrystals on products rather than evaporating the moisture like a traditional refrigerator or freezer. This keeps foods from dehydrating. Typically blast chilled items can be stored for about 5 days, although shock chilling items can extend this timespan. 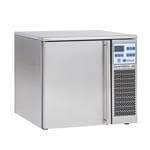 These units are ideal for operators looking to expand their menus and prepare foods ahead of time. They’re also great for kitchens that have a limited production area, as you can prepare batches, chill, and store items for later use.